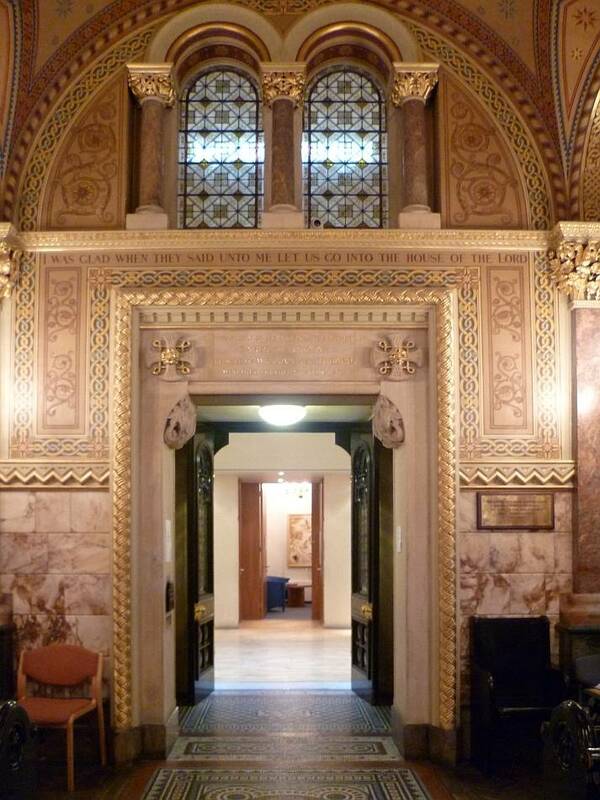 Entrance to St Christopher's Chapel, Great Ormond Street Hospital for Sick Children. E. M. Barry. 1875. Interior decoration: Clayton & Bell. Listed Building. By a "unique feat of civil engineering" (Weinreb et al. 344), moved here from its original location prior to the rebuilding work of the later 20c. Restored, and officially reopened by Diana, Princess of Wales, on Valentine's Day 1994. Great Ormond Street, London WC1. 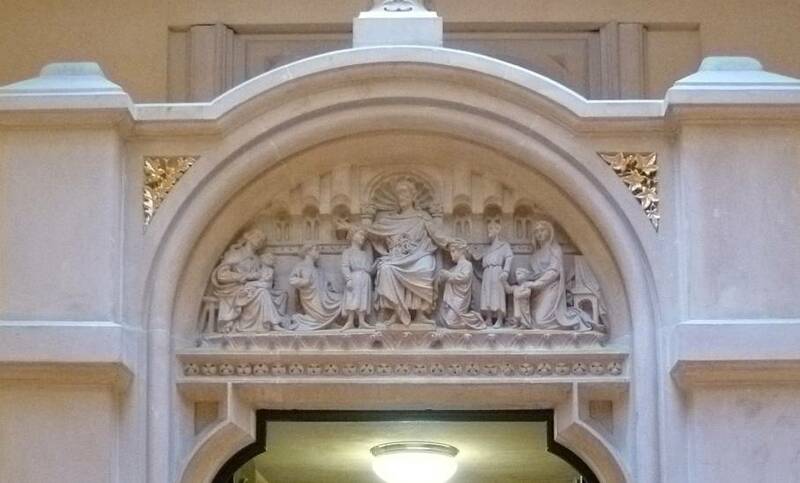 The sculpture above the entrance is of Christ blessing the little children. Left: Interior of the chapel. Dedicated to St Christopher as the Patron Saint of children, the chapel is brilliantly decorated inside in "elaborate Franco-Italianate style" (listing text), with many of its details referring to childhood. Right: Central dome. In the middle is a pelican pecking at its breast in order to feed her young with drops of her own blood — a symbol of Jesus sacrificing himself for humanity (see Crossley 22). Around this powerful emblem are angels playing a variety of musical instruments. The interior is small and rectangular, but only just — Joan Crossley describes it as about 26' square (21). The main part is divided by four columns, and has a central dome, with an apse at the east end. 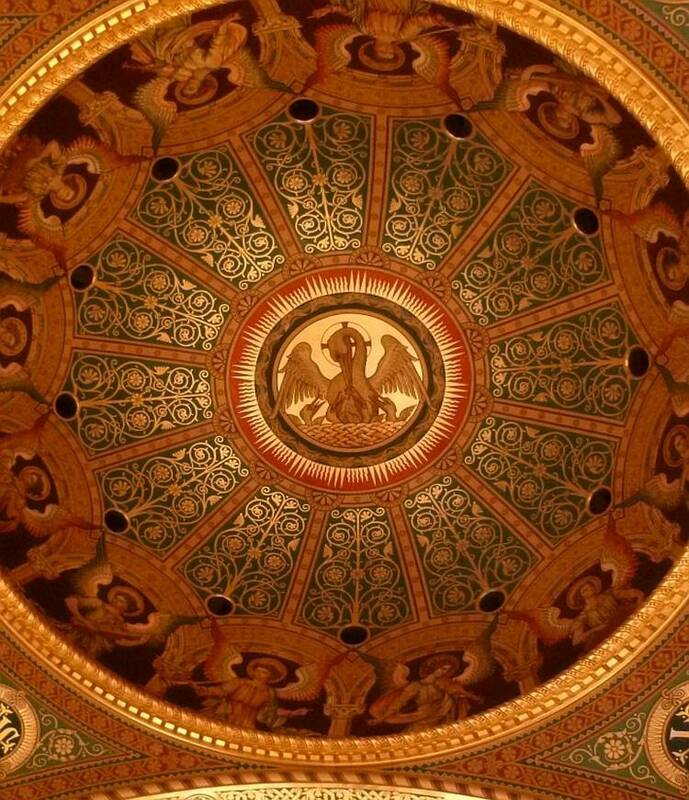 Its grandeur is given warmth by the painted and gilded decoration covering its ceiling, its strapwork and dogtooth patterned arches, its murals and beautiful Clayton & Bell stained glass windows, all focussing on children. 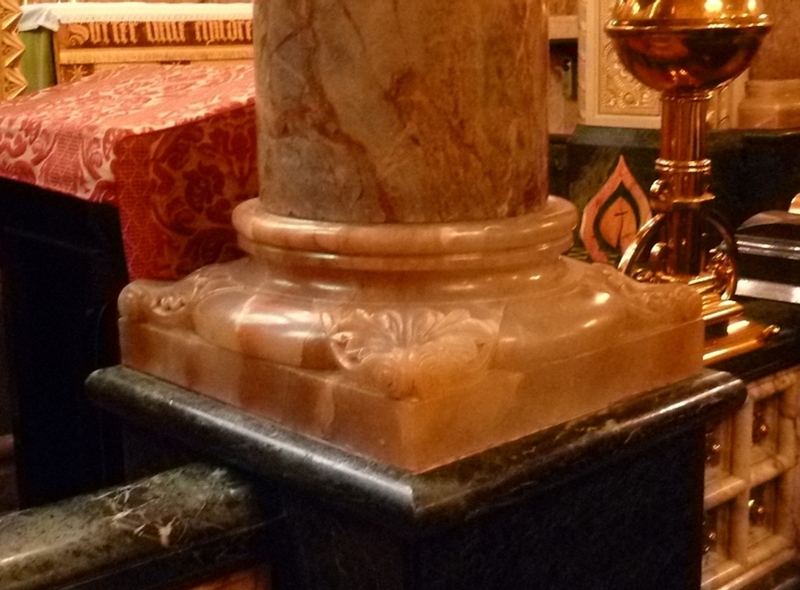 The materials themselves glows with rich colours and embellishments, from the red Devonshire marble columns with their gilded capitals and carved alabaster bases to the alabaster and marble altar screen with its brass roses. 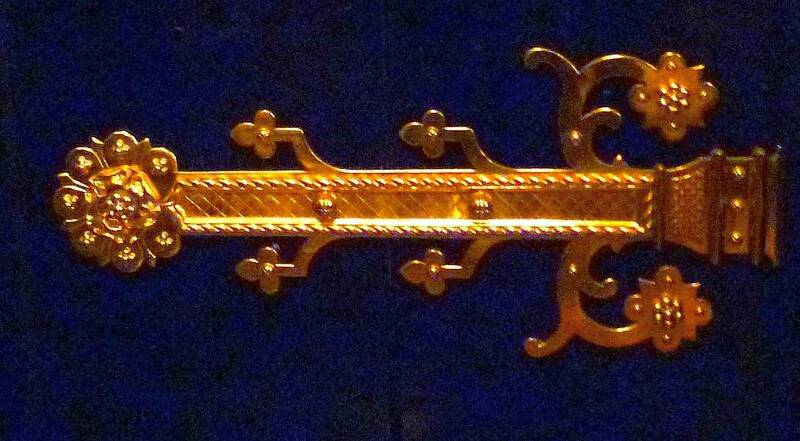 The brass gates in front of the altar even have crystal knobs. The walls are also faced with alabaster and marble. Such extravagant splendour may (and indeed did, to an early reviewer) seem excessive in such a context, especially as the hospital was originally expected to cater for the poorest children. But it was made possible by Barry's brother William, who donated £40,000 for it, in memory of his wife Caroline (see Crossley 21). 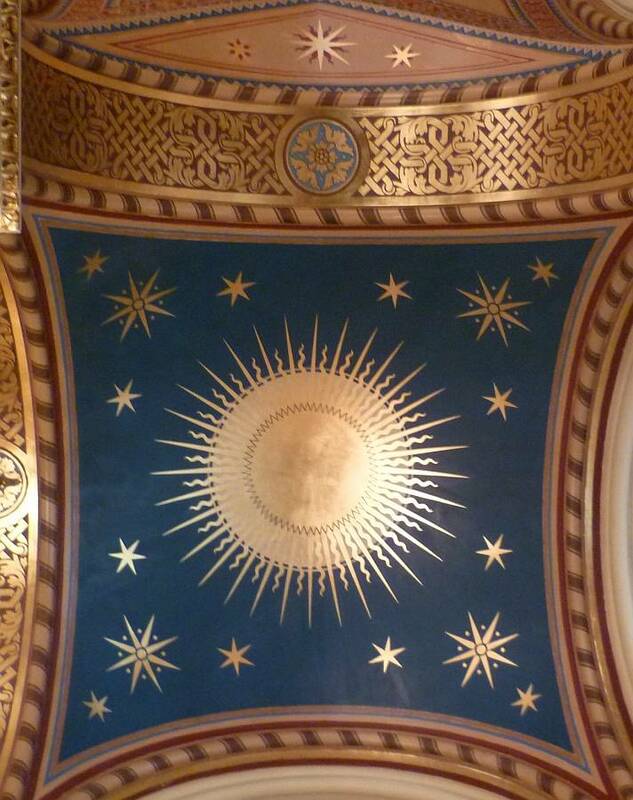 Left to right: (a) The sun and stars decorating another ceiling panel. 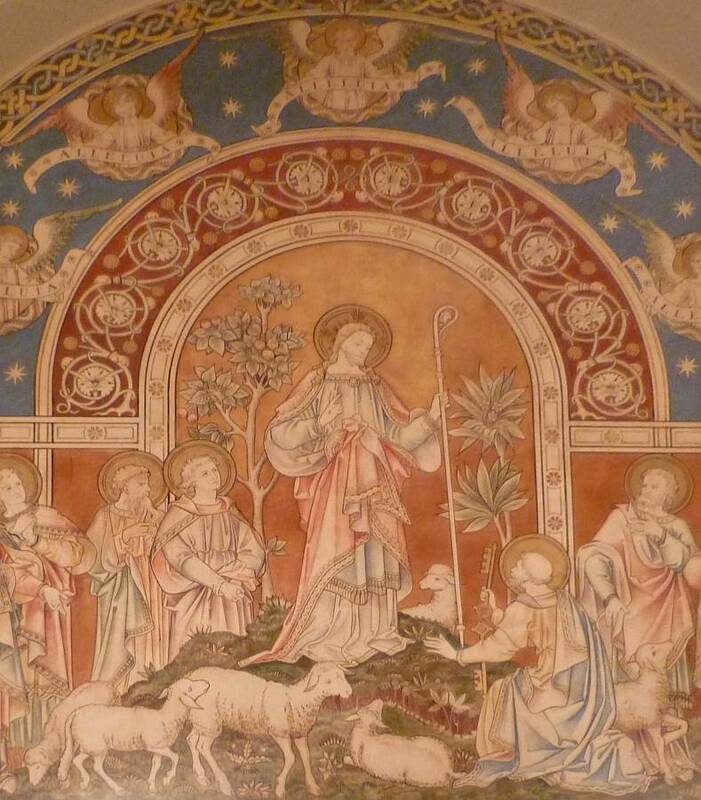 This motif is echoed in the apse, which is equally richly decorated, with a central roundel of the Lamb of God and flag (the same Christian symbol used in London's Middle Temple, and seen, for example, in the Temple Church). (b) St Matthew. The four disciples are depicted around the central dome. 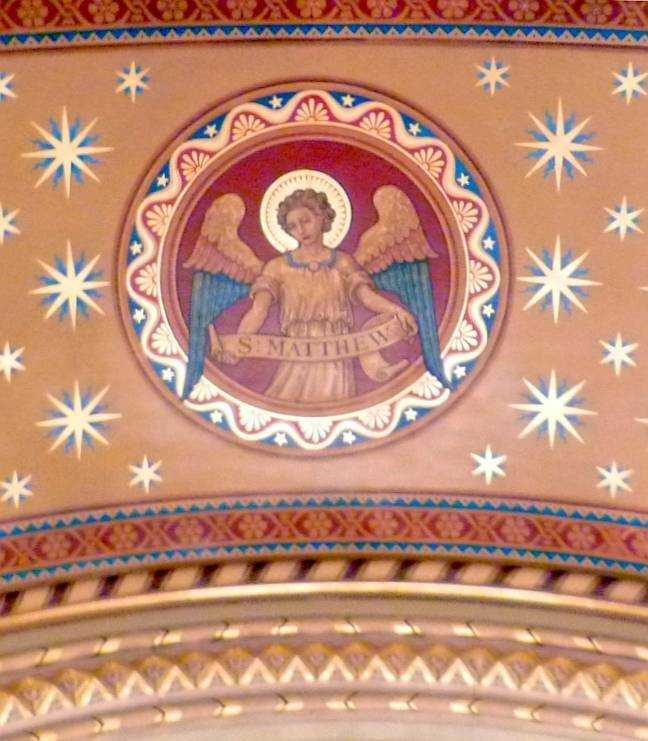 Around the vault of the apse are angels bearing banners displaying the seven Christian virtues, including one of the hardest of all for children to practice: Patience. Elsewhere, the idea was to "provide illustrations of the Christian faith for those who could not read" (Crossley 21). (c) Mural on the south wall. This is captioned underneath, "FEED MY LAMBS * FEED MY SHEEP." 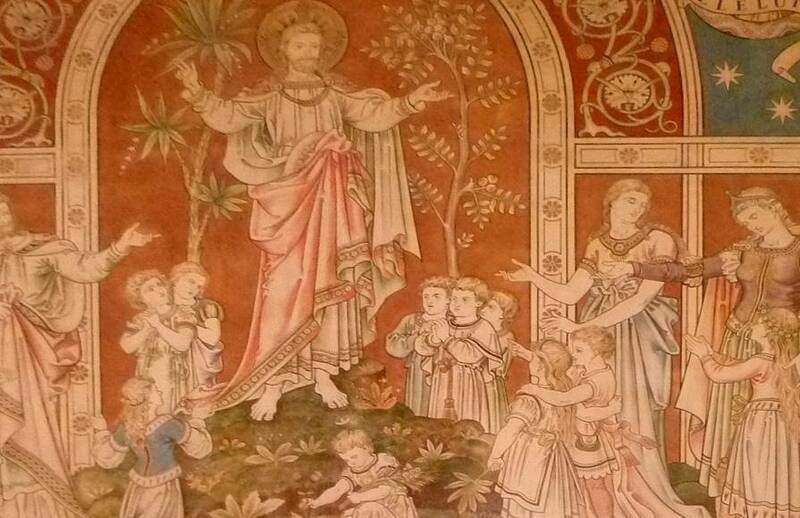 Detail from "SUFFER THE LITTLE CHILDREN TO COME UNTO ME" on the opposite wall. This universalises its message by showing children in costumes from different periods. Raymond Lunnon suggests that one little girl looks very like Alice in Wonderland (probably the one in the foreground, who has an Alice band and is carrying a large leaf). The chapel certainly has literary associations: the sanctuary contains a memorial plaque to Charles Dickens, as "HONORARY GOVERNOR, INSPIRER AND CHAMPION OF THE HOSPITAL" and "THE CHILDREN'S FRIEND." On the other side of the chancel arch is another such plaque, this one in memory James Barrie, who in 1929 gifted the copyright of Peter Pan to the hospital. 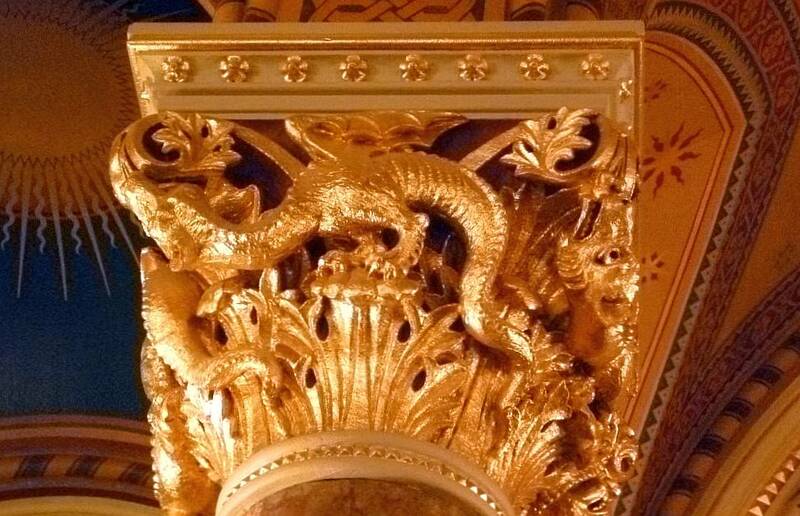 Left: One of the gilded capitals, incorporating real and mythical beasts. This one sports an alligator or crocodile. Also among the foliage can be seen what look like a monkey's head on the right, and a fish's tail on the left. A griffin, lion, and squirrel can be made out elsewhere. (b) Closer view of the altar. 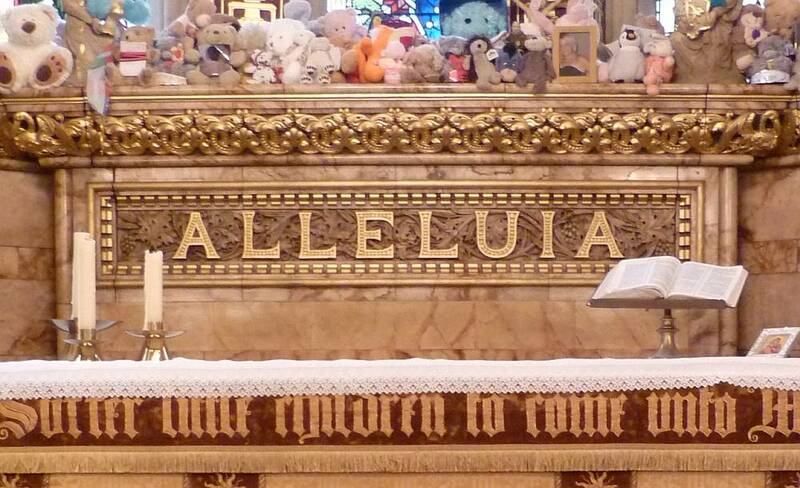 The gilded text along the bottom, "Suffer little children to come unto me," is given sad point by what is known as the "teddy bear choir" of soft toys above, each toy put there by parents in memory of children too ill for the hospital to save. (c) The carved marble base of one of the pillars. Notice the low altar screen to the right, with its brass roses. Like the black ebonised pews, this is of a height appropriate for children. 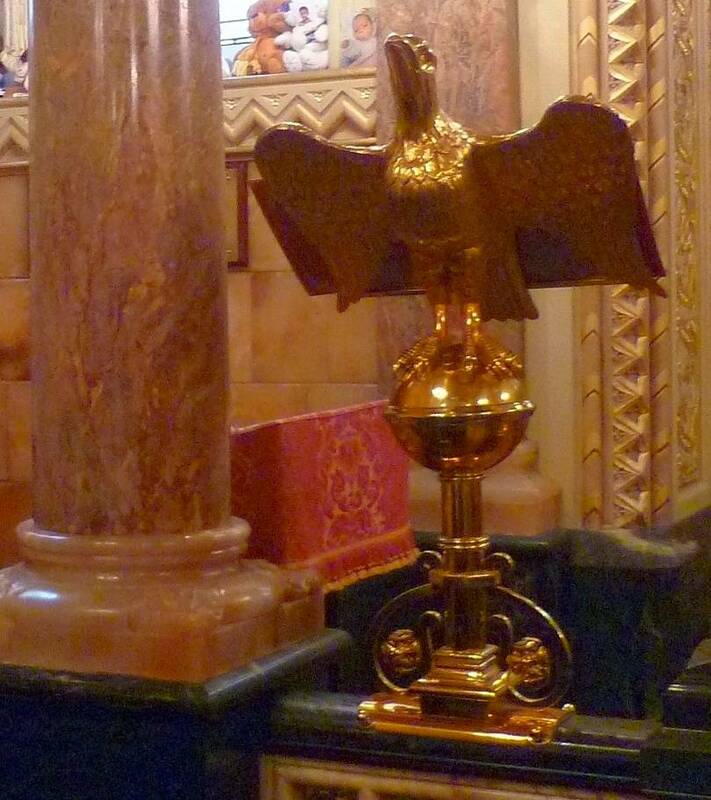 Left to right: (a) The brass lectern, featuring a particularly fine, lifelike eagle. Other metalwork in the church is just as noteworthy, including the beautiful contemporary light fittings and the different types of door hinges at the entrance (see the example below). 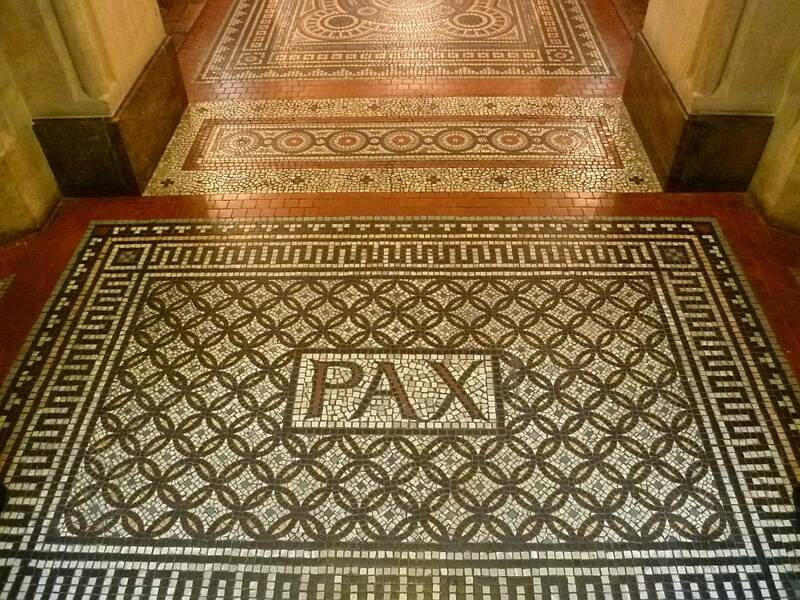 (b) The mosaic tiling at the entrance. This is Salviati-work and is thought to have been "modelled on a pavement in St Mark's, Venice" (Lunnon). (c) The entrance portal from within the chapel. Painted on either side of the door are St Peter and St Paul. No wonder Lunnon describes this chapel as "a real 'tour de force' of High Victorian ecclesiastical style." 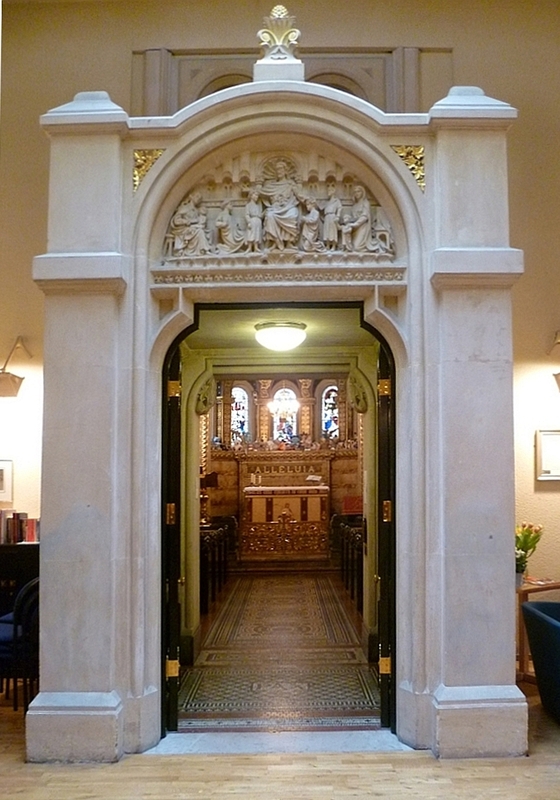 He also quotes Oscar Wilde as calling it "the most delightful private chapel in London." It is a very moving place to visit, in the knowledge of all those who have prayed here over the years, whether looking for consolation or giving thanks. Crossley, Joan. 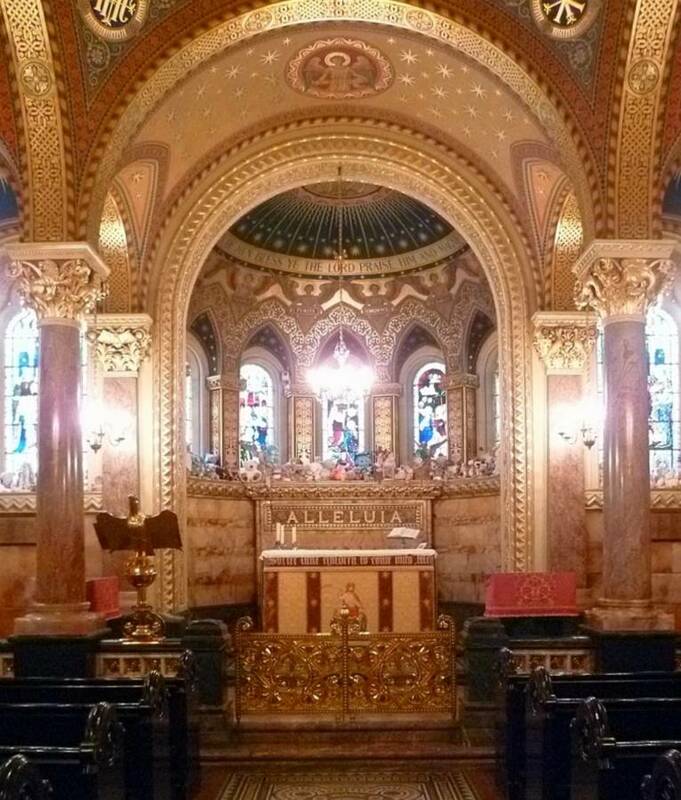 Sacred Spaces: The Hospital Chapels of London. London: The Museum of London Archaeology Service, 2005. Print. "Great Ormond Street Chapel in Central Block." British Listed Buildings. Web. 16 February 2012. Lunnon, Raymond J. The Chapel of St Christopher. NHS Booklet. London: GOS Trust, 2002. Available as a pdf file. Web. 16 February 2012.